DC Design House 2012: Snazzy Small Spaces — Sukio Design Co. Although grand in many ways, this year's Design House also presented some small-space challenges. My favorite solutions are the second floor foyer and third floor bath - itty bitty rooms with lots of pizazz. You’ll immediately notice that the second floor foyer is covered in black embossed croc (hence why it’s a fave). The designers Carolyn Winston and Elizabeth Boland used fairly traditional furniture but modernized the space with a high-contrast color combination. Mr. Lincoln approves! The third floor bath demonstrates one of the most repeated lessons in design. 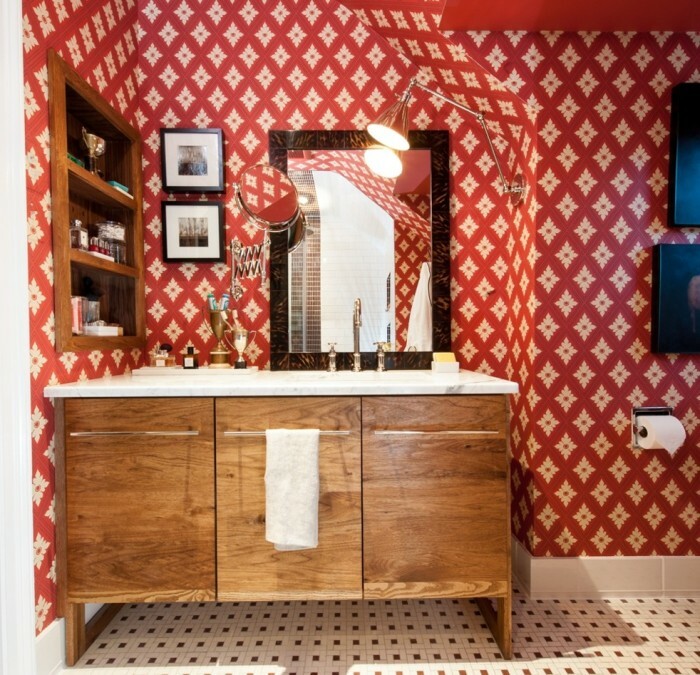 Liven up a small space with boldly printed wallpaper. Designer Christopher Patrick selected the paper to complement existing floor tiles. Why replace when you can make it work? The vanity was custom built by design pal Kaleo Kala and topped with carrera marble. I think it turned out splendidly. See more pics of the DC Design House on Sukio’s Facebook Page!